Use the Force to Bring Yoda’s Wisdom into Your Collection! Star Wars™ has captured the imaginations of several generations with everything from its simple portrayal of good versus evil that turns into grey areas as characters go from one to the other to its stunning special effects. One of the most famous lines from the entire series, “Use the force,” emblazoned itself on the minds of viewers young and old, especially those dreaming of the impossible. Yoda used the line in the scene as he trained young Skywalker to do what he thought was impossible – raise a plane out of a swamp. Sometimes jokingly but more often seriously, dreamers and doers in all walks of life use the phrase as inspiration for their own goals and dreams. This stunning coin can buttress that inspiration, as it features the very scene in which those powerful words were uttered. A FAN FAVORITE IN AN ICONIC SERIES– This coin comes from the sixth issue in the New Zealand Mint’s Star Wars collection, which features some of the most beloved characters from the wildly popular movie series. 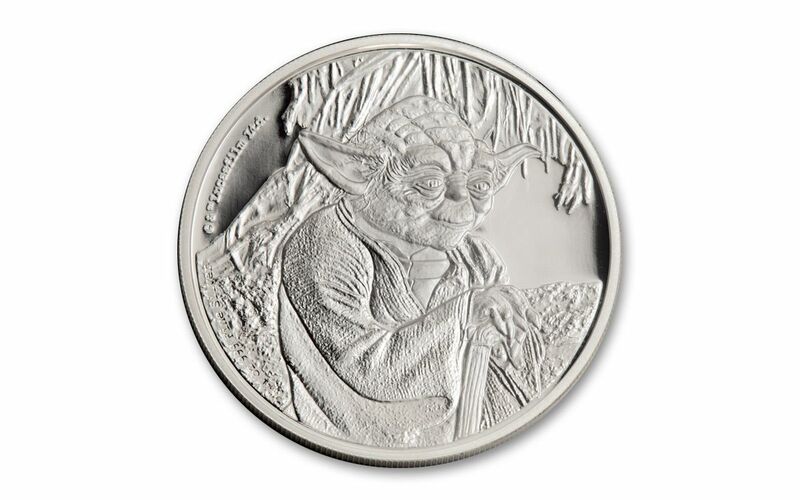 The coin bears an image of Yoda™ as he trains a young Luke Skywalker™ to “use the force,” one of the most quoted lines in the entire series. A HIGH STANDARD OF PURITY– This coin was struck from 99.9% pure silver, which is among the highest standards of purity available. It makes for a stunning canvas for this special theme. 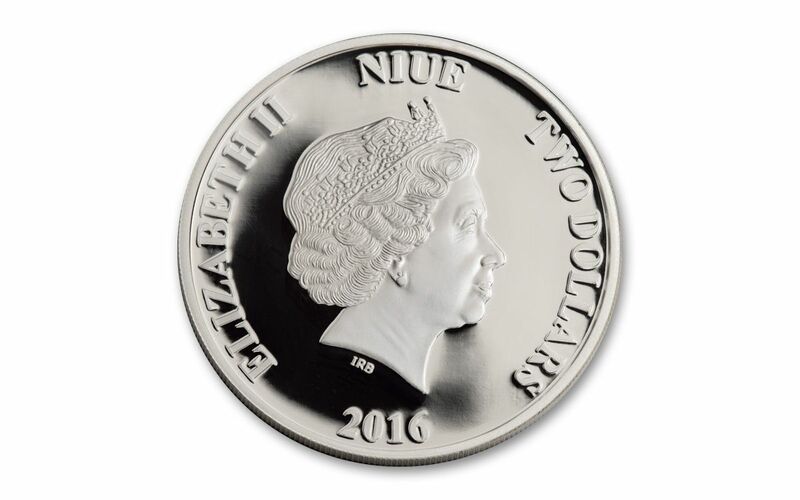 NIUE LEGAL TENDER– This coin, like the other 1 oz. 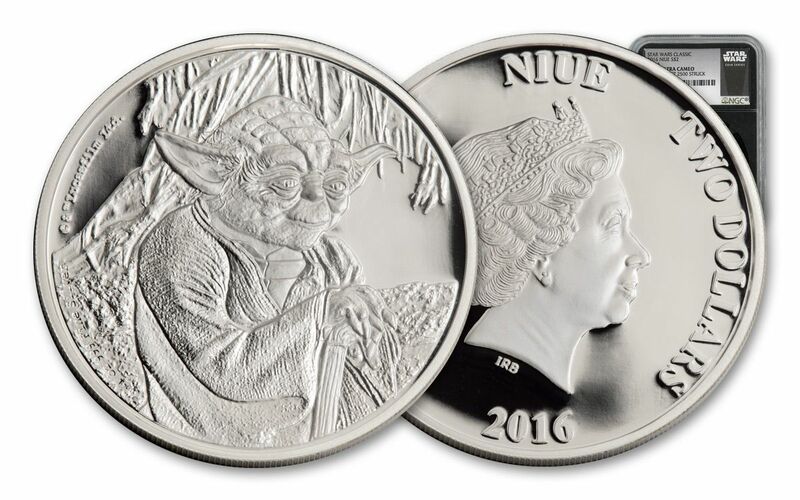 silver coins in the Star Wars Series, is $2 legal tender in Niue. Niue is a small island nation that sits between Tonga, Samoa, and the Cook Islands. CERTIFIED FLAWLESS- Your coin will be certified Proof-70 Ultra Cameo (PF70UC) by Numismatic Guaranty Corporation (NGC), a distinction that means your perfectly-graded proof will have ZERO imperfections -- showing all features and fields exactly as the engraver and mint intended! 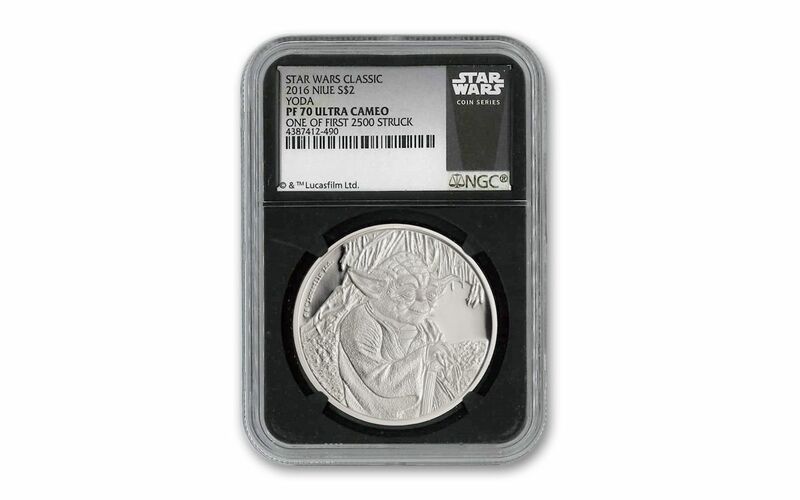 A LIMITED MINTAGE – This coin is part of a limited mintage of just 10,000 pieces, quite low given the tens of millions of Star Wars fans throughout the world. Yoda’s sage advice to ‘use the force’ often gets equated with things like the Law of Attraction, total commitment, and the removal of self-doubt. It underscores the true power of will that drives so many of the world’s achievers, whether they are looking to change the world or just their lives. That inspirational undertone broadens this coin’s appeal even more than the draw of the Star Wars theme generally, which makes this coin’s mintage of just 10,000 pieces seem all the more limited. Order yours from GovMint.com today because even the force won’t make more available!